Looking to create an AI proof of concept? This 5 step guide is designed to ensure you’re able to scope out opportunities for AI, build and deploy solutions, and successfully scale them up when demand increases. Despite this clear potential, many organizations are still at the AI starting blocks and AI adoption is not necessarily happening as fast as reports in the media and academia can sometimes ...make it seem. As enterprises look to begin their AI journeys, the more common use cases exist around image/visual recognition, natural language processing (NLP) and predictive maintenance. 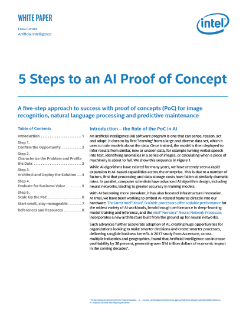 Discover what makes an effective AI proof of concept. Learn how machine learning and artificial intelligence are enhancing our lives by leveraging Intel processors and innovation.